Can Sunrise save mecha anime? I guess...? With the Gundam creative team busy flicking paper footballs at each other and the memory of Code Geass fading from everyone’s mind to nothing but a handful of memes, Sunrise is hard up trying to find the successor to the teen robot opera throne that’s been vacant for some time now. It’s no longer even a question about what the next great mecha show is since everyone's resigned to the idea that there will never be another great mecha show so long as 3DCG animation remains the new standard. Now that all the people that could design and animate hand-drawn robots are dead, the matter has become one of taking what we can get. It’s no longer even a question about what the next great mecha show is since everyone's resigned to the idea that there will never be another great mecha show. 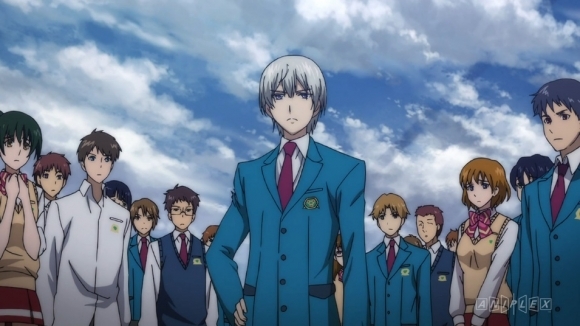 Valvrave the Liberator begins with the invasion of a neutral space colony by a militant nation that is after the Valvrave, a humanoid robot developed in secret underneath a high school. 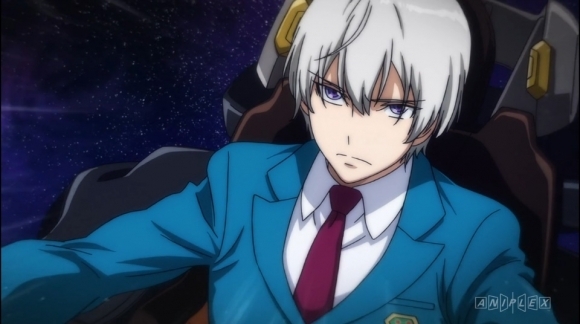 In the midst of the crossfire, Haruto Tokishima infiltrates the Valvrave and protects the colony from invasion. Despite gaining the admiration of 700 million people from all over space who watched his battle streamed live on the Internet, Haruto is broken with grief over the death of his childhood friend. After the credits, Haruto is stabbed through the heart and shot twice in the chest. Even though the main character has died, the episode isn’t over. But don’t let me be the one to spoil it for you. Valvrave the Liberator is an anime where things happen (and continue to happen) for twelve episodes. 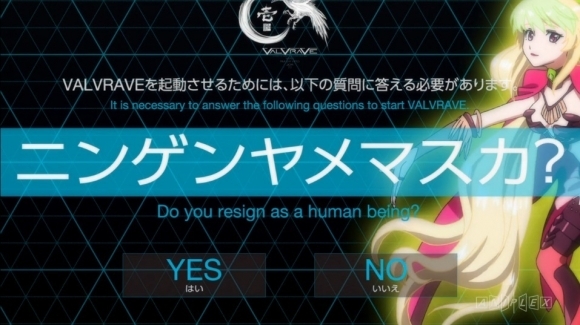 Valvrave is almost intelligent in how stupid it gets, how it teases all the answers to some of the most audacious questions and gaps in logic it presents. We’re reaching Macross Frontier levels of awfulness when a retired idol steps up to [spoiler] and saves the day with the power of [spoiler]. But Valvrave gets away with it just by exhibiting so much confidence in where it moves the plot. By leaving so much up to theorization and tossing the audience bits and pieces of the bigger picture on a regular basis, Valvrave sinks its hook in deep and early. Valvrave Season 1 just finished its simulcast, courtesy of streaming site Crunchyroll. Check out the first episode for free right here! It seems as if Sunrise finally has their math on the right track, and if perhaps not arriving at the next Code Geass , the studio is closer than ever to discovering the magic formula behind what the kids like to watch. One important step towards that goal is that I find myself actually caring about the characters in this show. Everyone is written and characterized in broad strokes, but there’s this exuberance at work that alleviates the weight of the combat and politics. I sympathize for these high schoolers when they lose a classmate who may have had not more than a few minutes of screentime, and I want to see them get the better of all the adults seeking to quash their insurrection. Somewhere between episode 1 and episode 2, I gave up on subtlety and embraced Valvrave’s philosophy of plot progression. As a mecha show, Valvrave doesn’t have much to show off on the technical end. The Valvrave design itself is okay but probably too close to Mobile Suit Gundam 00’s Masurao for my tastes. The enemy mechs are kind of silly and bulbous, almost never appearing like they give the Valvrave much trouble. Factor in the “all CG, all the time” aspect, and one might think Valvrave sets itself up for some lame space combat. That’s not the case at all however. 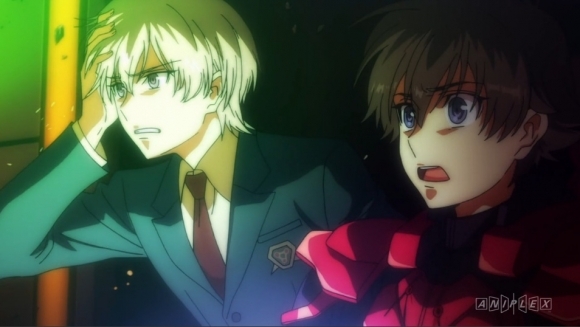 Since certain characters can’t [spoiler], Valvrave isn’t afraid to be as brutal as it wants to be, which ramps up the tension with each episode. The show is so fearless in the ease at which it allows characters to die, fail, and commit mistakes, that it feels like the story could go in any direction from one minute to the next. Valvrave is easily the most entertaining robot show to come around in a long time. The series demonstrates such a reckless abandonment of principles that, after one unapologetically terrible bit of writing in the later episodes, it feels like the fun is over for good and the trainwreck of shame from which there is no recovery is on its way. This is regrettable, since Valvrave is easily the most entertaining robot show to come around in a long time. I should condemn Valvrave outright for the direction it takes, and the general opinion arising from the controversy dictates that nothing can make up for what has been done. Yet, after the last episode, I can’t bring myself to tear the show down before knowing what happens in Season 2. Valvrave is a wild ride that’s enjoyable until it leaves you feeling equal parts dirty and guilty (right before the end). Will I bring myself to give the show another chance when the second season airs? Sure, but not without some qualms. It’s unfortunate that the show falls victim to its own immaturity and that one scene will color the rest of the experience forever, but as it stands, I can only call judgment on Season 1. In spite of some thoughtless decision-making on the part of the writers, Valvrave is the only interesting robot anime released this year. Even if it's all we can get right now, more often than not, it’s more than a little good. This review is based on the Crunchyroll simulcast.